Carton labeling is one of the most basic automated labeling applications. Most carton labeling application are straight forward. 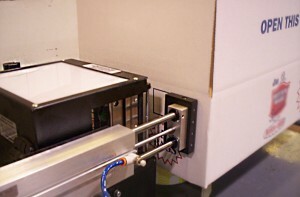 A labeling unit with a tamp applicator applies a printed or pre-printed label to the side of the box. All of FOX IV’s labeling units can print and apply or apply preprinted labels to cartons. The question is, HOW do you want to label the carton? Do you require a certain print engine or data stream? What side of the carton do you want the label applied to? Do you need adjacent panelcarton labeling or corner wrap? What size is the label? What is your throughput? All of these questions should be considered when selecting the best labeler for your application. FOX IV can help you with your carton labeling equipment selection as well as integration and installation into your production line. Because FOX IV has the most extensive range of print and apply units, we are able to offer printer applicators with any of the major label printer engines. 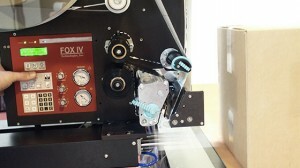 FOX IV printer applicators and applicators can handle most label sizes. We even have units that can apply a HUGE 8.5″ x 17″ label! Depending on your throughput rates, FOX IV offers different body sized units. Our compact Mini printer-applicators utilize a 8″ OD label roll and are ideal for low volume applications or space restricted applications. The Standard body size can handle up to a 16″ OD label roll and is perfect for high volume and long carton label applications.